Jian'ou is a county-level city in Nanping in northern Fujian province, China. Under the name Jianning, it was formerly the seat of its own prefecture and was the namesake of its province. Jian'ou is within a major bamboo and rice-growing area on Jianxi Brook, about 70 kilometres (43 mi) south from Jianyang. The Jian'ou dialect, a dialect of Northern Min, is spoken in Jian'ou. "of considerable size, and contains three very handsome bridges, upwards of a hundred paces in length and eight paces in width. The men of the place are very handsome, and live in a state of luxurious ease. There is much raw silk produced here and it is manufactured into silk pieces of various sorts. Cottons are also woven of coloured threads, which are carried for sale to every part of the province of Mangi. [a] The people employ themselves extensively, and export quantities of ginger and galangal. I have been told, but did not myself see the animal, that there are found at this place a species of domestic fowls which have no feathers, their skins being clothed with black hair, resembling the fur of cats. Such a sight must be extraordinary. They lay eggs like other fowls, and they are good to eat. The multitude of tigers renders traveling through the country dangerous, unless a number of persons go in company." Under the Yuan Dynasty, the name was changed from Jianning-Fu to Jianning-Lu. This was a result of an administrative restructuring: formerly, Jian'ou was the capital of the local fu, or prefecture. Jian'ou was made the capital of the local lu, a collection of prefectures still smaller than a province, and was renamed Jianning-Lu accordingly. 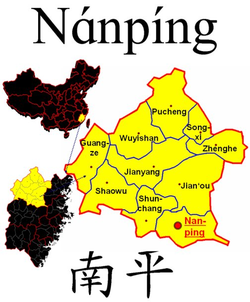 ^ Usually anglicised as Manji, the Chinese term Manzi (蛮子, meaning roughly Barbary) was the name north of the Yangzi for the lands south of it, lands now comprising the rump (or Southern) Song Dynasty centred at Hangzhou. Enduringly based in the north, the Mongols completed their conquest of the rump Song in 1279, annexing it in its entirety and reducing Hangzhou to one provincial capital among many in their vast Yuan Empire. The Yuan Emperor of course was Polo's nominal host for nearly two decades. For more on the term, cf. Names of China. ^ "The historical evolution of Jian'ou city / 建瓯市建制沿革" (in Chinese). Official website of Jian'ou government. 2017-05-02. Retrieved 2018-07-06. ^ Polo, Marco (1997), Marsden, William (ed. ), Make Poluo Lvji, Hertfordshire: Wordsworth Editions . ^ Polo, Marco (1997), Yang Zhijiu (ed. ), Make Poluo Lvji, Beijing: Foreign Languages College Research Publishing, p. 18 . ^ Polo, Marco, Travels of Marco Polo, ch. LXXIV, pp.199-200. ^ "An 800-year-old label may rewrite the history of a Java Sea shipwreck". Ars Technica. Retrieved 2018-07-20. ^ "Li Qiumei - the sports star of Northern Min" (in Chinese). Nanping Sports Bureau. 2010-07-14.